Nullification Crisis of 1832 Research Papers look into one of the first events in a chain of crises that ultimately lead to the Civil War. The Nullification Crisis of 1832 is one of the first events in the chain of crises that would ultimately lead to the Civil War. Following the economic depression of the 1820s, the US government had passed several new tariffs, including the protectionist Tariff of 1828, called the “Tariff of Abominations.” South Carolina’s economy was especially hard hit by the tariff, and state politics began to revolve around the issue of whether a state could overrule the federal government. Paper Masters can compose a custom written research paper on The Nullification Crisis of 1832 that follows your guidelines. In 1828, Andrew Jackson was elected President, with John C. Calhoun of South Carolina as his Vice President. Southerners were dejected when Jackson failed to abolish the tariff. Calhoun had argued that the Tariff went against the Constitution, believing that it favored manufacturing over agricultural interests, and would resign as Vice President in order to fight the issue in Congress. 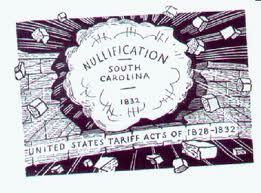 Many South Carolina politicians began to call for a nullification of the tariff in the state. The idea of nullification meant that a state could essentially veto the federal government. The Tariff of 1832 only increased South Carolina’s opposition and the popularity of nullification on the state level. In November 1832, a Nullification Convention met and declared that the Tariffs would not be enforced in South Carolina and that attempts at enforcement would lead to secession. President Jackson’s response was to threaten military action against the state. South Carolina backed down. Jackson himself later said that the tariff was just an excuse for disunion and the formation of a Southern Confederacy, and that their next excuse would be slavery. Civil War Economics research papers write on the financial situation of the Confederacy verses the Union. Inaugural Address of Andrew Jackson research papers discuss the tone of Andrew Jackson's inaugural speech and how it refers constantly to the US Constitution. African Slavery - African slavery is a controversial subject in society and in history. Order a research paper on African Slavery from Paper Masters. Economic History - papers look at the possibility of the U.S. Economic Crisis turning into a depression. Paper Masters writes custom research papers on Nullification Crisis of 1832 and look into one of the first events in a chain of crises that ultimately lead to the Civil War.